I'm so excited to share this cupcake tree with all of you! I love cupcakes and I really love Christmas, so creating a Christmas tree out of cupcakes is almost too much for me to handle! Mini cupcakes decorated with buttercream, gumdrops, and of course a bit of sparkle, give the tree a really fun look. It is a great project for all skill levels, and also makes a fabulous centerpiece for holiday parties. When I first thought of this, I couldn't wait to make it! I started out making my vanilla cupcakes and attached them to a styrofoam tree using toothpicks. Next I colored my buttercream by using green and brown food coloring to achieve that classic Christmas tree color. Using a star tip, I piped the buttercream on all the cupcakes. I used more toothpicks to attach gumdrops to the tree to look like lights, and fill in the gaps. I added some more candy and stars made out of fondant to add more detail. The last thing I did was cover a star in gold disco dust for the top of the tree. You had to know the disco dust was coming! There are endless possibilities when it comes to decorating this tree, and it's a wonderful project for kids to get involved in. I hope you make a cupcake tree this season. Enjoy the video! Cream butter and powdered sugar. Add 1 cup at a time on low speed so you don't have a powdered sugar shower in your kitchen! Meghan I'm right there with you when it comes to Christmas...Your cup cake tree is incredible...great party idea...what am I taking about, this tree is a party. So so so super cool!! That thing is awesome!! Beautiful! Love the bright colours, really Christmassy and a fab idea! This is super cute, but what if Santa got so distracted eating it, that he forgot to leave the presents. Wow! That is totally cute! I can't imagine how many perfectly frosted cupcakes I'd splat on the floor, trying to construct these, haha. This is adorable. You are so talented! I would definitely trade in the cupcake stand for one of these. This post really does reflect your passion for Christmas as well as creating in the kitchen. Bravo to your efforts here and thanks for the inspiration. Buzz Buzz! How cool is this?! They look incredible!! Amazing job! This is awesome, Meghan! I know that even if it's easy, MY skill level would end with cupcakes everywhere and frosting on the ceilings but I am still going to drool over this one. those are incredible! what an awesome idea! This is stunning! A centerpiece and dessert all in one! So pretty! Your cupcake tree is gorgeous! I wish I had the patience to make it myself! This is beautiful! You are so talented. What a perfect holiday treat, and not quite as complicated as I would've imagined. The video is very helpful! You are amazing. So much talent, this is really remarkable. Love it. This is absolutely amazing! I've pinned it and tweeted the pin! One of the prettiest Christmas ideas I've seen yet! BRAVO! super great idea for christmas! This is mad cool! I almost wouldn't want to touch it...almost. What an amazing Christmas tree! All edible...just can't imagine wanting to mess it up, with kids and adults alike grabbing at those yummy frosted cupcakes that so much work went into it! Strictly for show...would not let anyone get even near it, but that's just ME! Oh, my kids will be thrilled with this Christmas Cake. Such a nice idea!! Meghan this is so beautiful! WOW! Those looks truly amazing and so creative, almost a store display like! Im so tempted to do one, but Im pretty sure my tree will be crooked ;) Wishing you all the best! Remarkable! Awesome for a Christmas party! Thank you for sharing! By far the most amazing Christmas tree I have seen...EVER! Love it, it really is amazing! Wow, this is a show stopper cake for sure!! Gorgeous Christmas and best thing is it can be eaten! I am speechles! 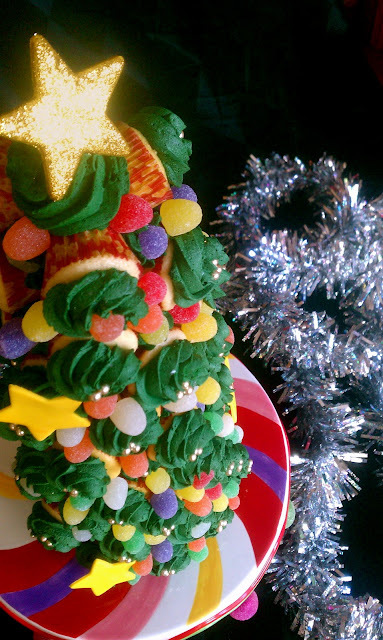 Your cupcake tree is amazing and so creative, and gorgeous. Congrats on the Top 9. I love this tree!! Congrats on top 9! Wow! This is just amazing! Congrats on the top 9! I really like this idea. I have done something similar using cream puffs and then pouring melted green icing over them. Delish! fantastic - just beautiful, I also tried chocolate covered strawberries as the filler. That is adorable, my kids would demolish that in 10 seconds flat! Wow! That is absolutely amazing! I would love to try something like that, but I don't think mine would turn out as pretty as yours. Wow, this is really beautiful...Love it! Congratulats for being on best picks for Food Buzz, this one puts you way on top! Just adorable! This is so cute. I just can't get over it. I want to make one now! Absolutely amazingly beautiful and so creative. Will be trying this for Christmas this year. Congrats and thanks for sharing. That must have taken forever but it looks great! Love this!! Perfect Christmas centerpiece. Thank you for sharing! wow! This looks amazing and delicious! Congrats on top 9 and Happy Holidays! 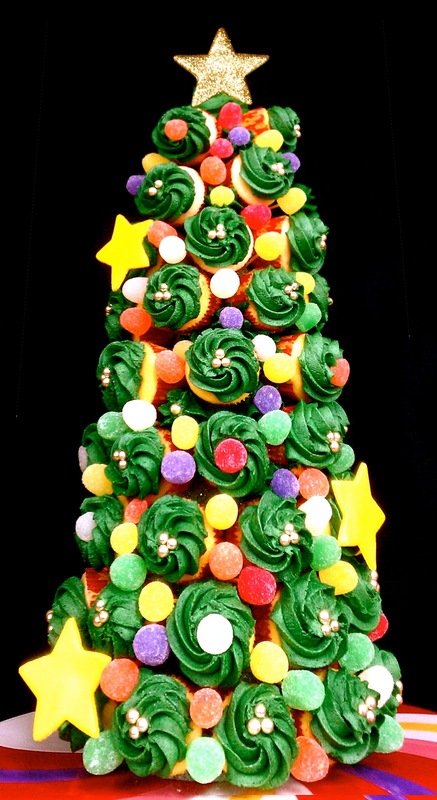 Fantastic cupcake tree! Love your blog! SOOO cute! And congrats on it making it to the Top 9! cuteeeee...where can we buy this styrofoam tree? ?pplz let me know.. Thanks! You can get the styrofoam tree at Michaels. Okay, your frosting didn't droop or slice right off the cupcakes? Maybe the icing is stiffer than a standard one? I'd love to fully understand before committing to making it for a party I'm bring dessert for. Nope, frosting didn't droop at all. I made a stiff buttercream that worked really well. This is so beautiful! What a great idea! This is spectacular! So much more beautiful than simply placing the cupcakes on a table. I am sure they are delicious as well, since I am sure you are a pro at making them :)! fabulous !! looks so festive & colorful...great idea . happy holidays !